Ever since I was about 9 months old, I’ve eaten a farm-fresh egg for breakfast. It started out as a soft-boiled egg yolk, and now it’s a nice scrambled egg that I can feed myself. Sometimes Mama puts cheese on it, sometimes even salsa (¿huevos rancheros, anyone?). Mama’s eggs are my favorite because she makes them soft and fluffy. She says the secret is taking them out of the pan before they’re fully cooked. This morning I didn’t feel like eating my egg (though the dog sure appreciated it), so Mama decided on eggs for lunch. And this time, she did something I’ve never seen before. She put them in a pot of water and put them on the stove. Once the water started boiling, she turned off the heat, covered the pot, and let them sit about 10 minutes. Then she ran the eggs under cold water in the sink. Then Mama showed me how to crack ’em: She knocked one on the counter, rolled it under her palm, then peeled the shell right off! Needless to say, I was hooked on this whole cracking business. We peeled four eggs, and then Mama mashed them with a fork. She added some mayonnaise (she told me I was too young for the homemade kind) and Dijon mustard, a splash of vinegar, salt, pepper, and capers. She had her “egg salad” on toast, but I liked it right off the spoon. Good show, Mama. I love eggs so much I couldn’t wait for them to be mashed. Mix the eggs, mayo, mustard, vinegar, and salt and pepper in a bowl and mash until well combined. Stir in the capers and/or dill, if using. Serve on bread or toast. *Note: These amounts are approximate. Start small and taste as you go! The result should be creamy and hold together. Categories: Hits, With recipe | Tags: baby food, cooking, cooking with toddlers, egg salad, eggs, recipe, vegetarian | Permalink. ooooh if only my boy Erling could love the eggs I love so much. Egg allergy! doc says wait a while, hopefully it will pass. 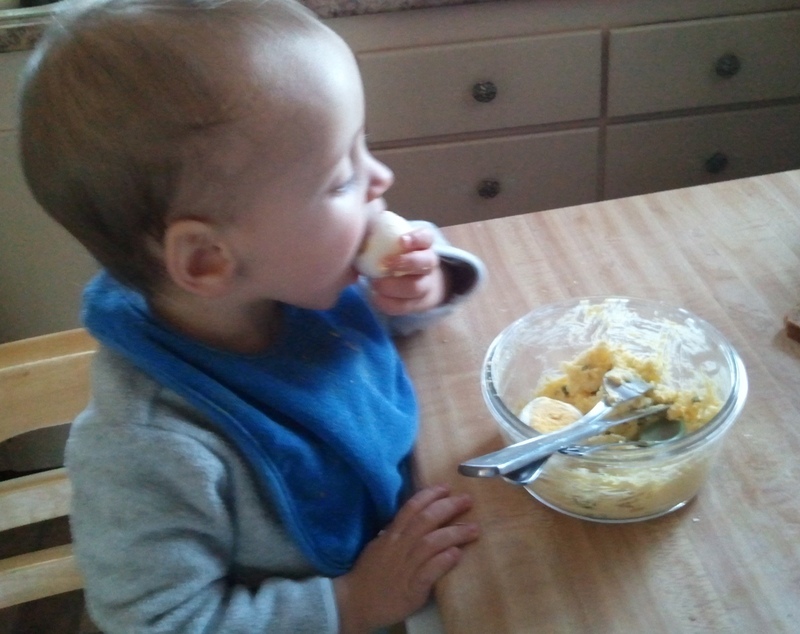 I feel bad, though, enjoying delightful egg salad while my wee one can’t take a taste… in time, in time. I couldn’t imagine not eating eggs, Mrs. Mork. I shudder at the thought. Poor Erling. I hope he outgrows his allergy very soon.